but fine up against a wall." Bred circa 1900 by Louis Van Houtte, Belguim. 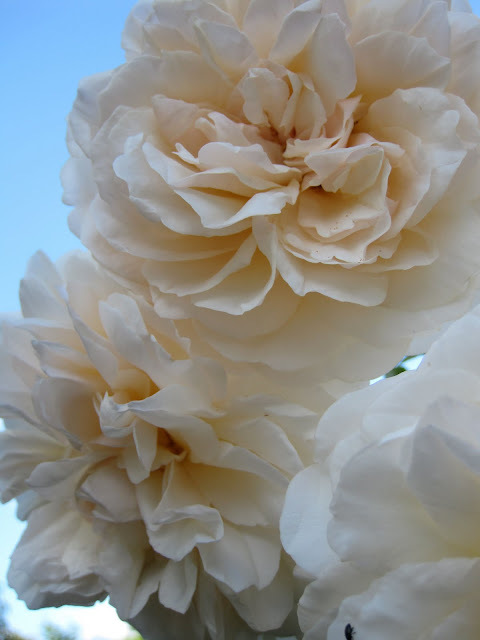 The only thing, I like about roses, are the names (Lady Emma Hamilton, Jude The Obscure, Queen of Sweden, Souvenir de la Malmaison). And that makes me the only person in Great Britain, who is NOT totally enamored of the rose. 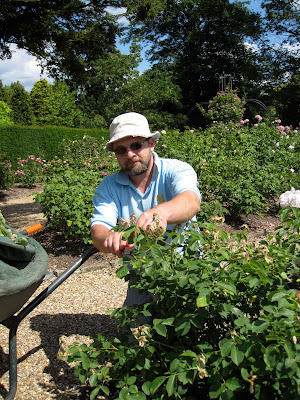 I spent the day with John Keen, the Rosarian at Nymans, deadheading. 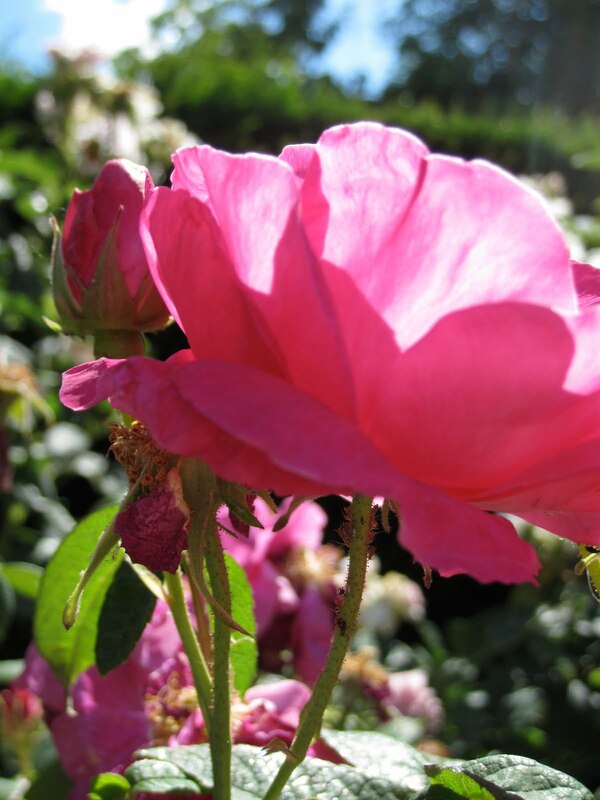 We had a chance to talk about the new organic regime of rose care at Nymans. Also known as R. gallica maxima, the Old Red Damask, and the Red Rose of Lancaster. A shrub of ancient pedigree, before 1300, still grown for its historical associations. Three years ago, under the direction of Head Gardener, Ed Ikin, the rose garden was redesigned and reinvigorated. Up until five years ago, the rose garden, which dates from the 1910's, consisted entirely of old-fashioned roses. Consulting with Michael Marriot of David Austin Roses, Nymans decided to change the balance. They kept 30% of the old-fashioned roses and brought in 70% David Austin roses. 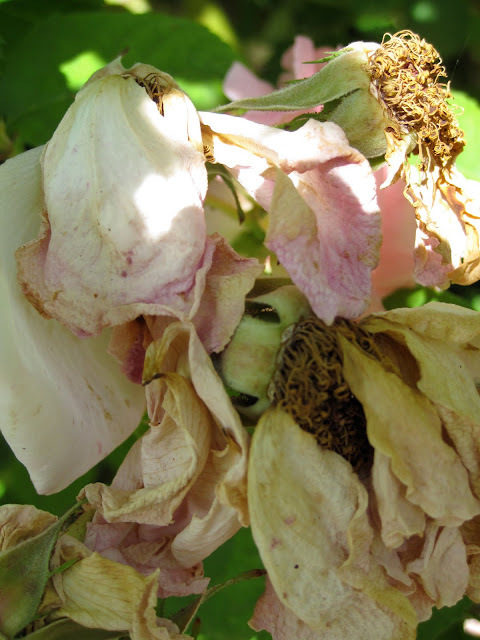 This decision resulted in an expanded color range, repeat bloom and disease resistance. but often develop a wonderful combination of sauterne wine and strawberry. This technique was developed at the University of Adelaide in Australia. The milk spray (full cream milk) Ratio of 1-10 with water is used to prevent mildew, black spot and rust. The natural antibiotics present in milk, as well as the production of other agents during exposure to sunlight both act to reduce fungal infection. of the Royal Horticultural Society to commemorate the Society's bi-centenary in 2004. This is a product from Guernsey, Channel Islands,UK. SB Plant Invigorator is a kind of jack of all trades. It is used for pest control, fugal diseases and general plant health. gradually opening to form neatly cupped rosettes. Derived from fresh Norwegian kelp (Ascophyllum nodosum). Contains over 70 minerals, micro-nutrients, amino acids and vitamins. One of the finest Damasks in commerce today. Garlic Barrier is a natural extract of garlic and bio-stimulant. 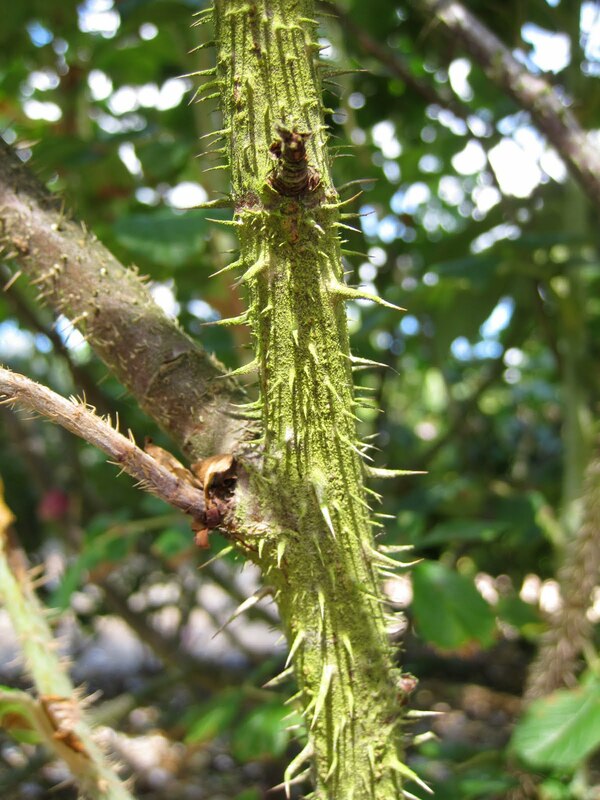 It aids in natural resistance to disease and helps the plant to recover faster from fungal disease. Overall, it reinforces the plant's natural ability to resist disease. 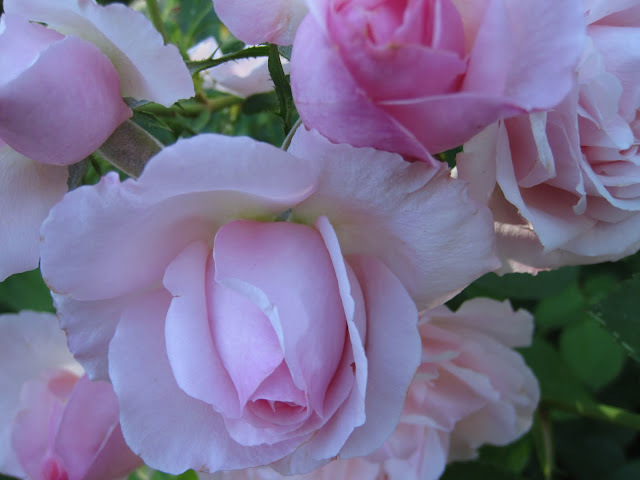 PRUNING: In addition, Nymans has instituted a pruning regime for old-fashioned roses. Pruning harder on the outside of the plant, creating almost a basket-like effect, which results in outer growth with stronger stems. I asked John what interested him about roses. 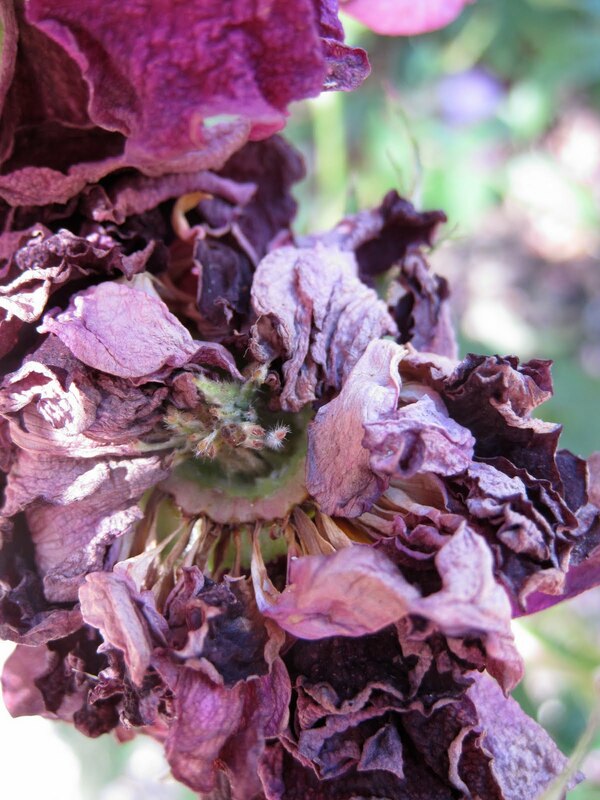 "They are such an old flower. They are caught up in history. They have a story to tell." 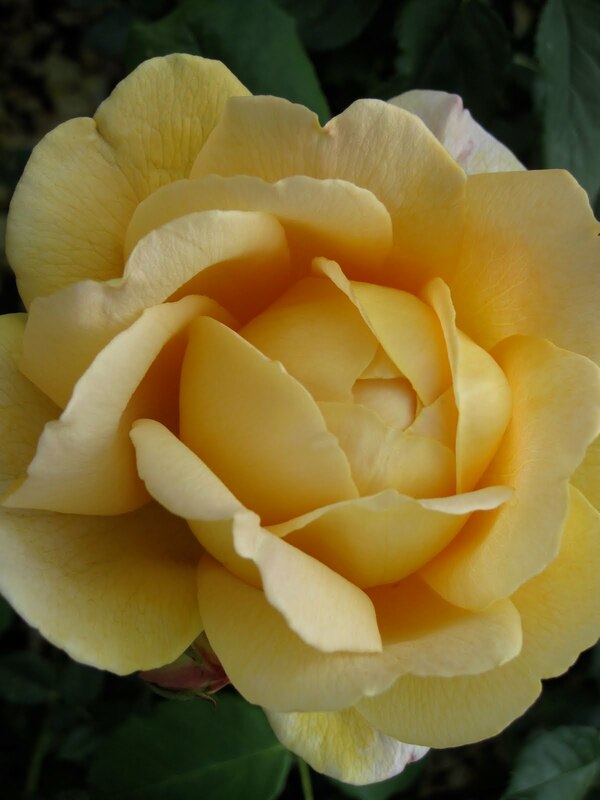 Since classical times, the rose has been a symbol of secrecy. Greeks used roses to decorate the ceilings of their conference rooms. This indicated that everything discussed was confidential, which is the origin of the phrase sub rosea. 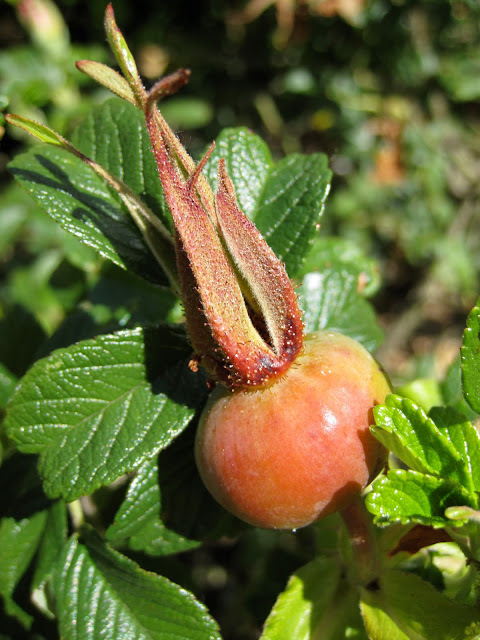 In sixteenth-century England, a rose was sometimes worn behind the ear of servants, tavern workers, and others to indicate that the wearer heard all and told nothing. In Germany, roses in a dining room suggested that diners could speak freely without fear that their secrets would travel beyond the room. I have been at Nymans for one week. 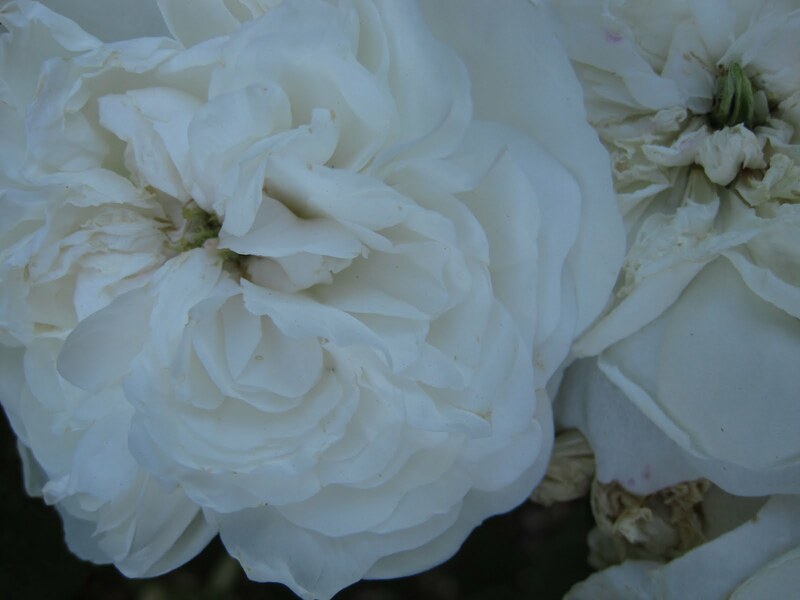 So far the Rose and the English character have a lot in common: they are both soft, delicate, ephemeral, and mysterious. As part of my Sustainable Gardening Fellowship with the Royal Oak Foundation, and The National Trust, I will be blogging about different aspects of sustainable gardening in the UK.